The Abu Dhabi Dialogue (ADD) Senior Officials’ Meeting (SOM) was held on 8-9 May 2018 in Colombo, Sri Lanka.The ADD was established in 2008 as a forum for dialogue and cooperation between Asian countries of labour origin and destination. The ADD consists of the twelve Member States of the Colombo Process (CP), namely Afghanistan, Bangladesh, China, India, Indonesia, Nepal, Pakistan, Philippines, Sri Lanka, Thailand and Vietnam; and six Gulf countries of destination: Bahrain, Kuwait, Oman, Qatar, Saudi Arabia and the United Arab Emirates, as well as Malaysia. Regular observers include the IOM, ILO, private sector and civil society representatives. The permanent secretariat is provided by the United Arab Emirates, and the current chair-in-office is Sri Lanka. 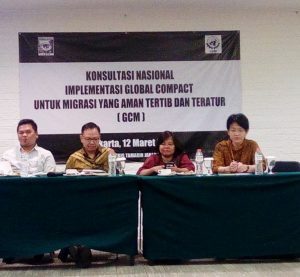 The Migrant Forum in Asia (MFA) network was invited to send a delegation to the ADD SOM or the first time, after years of engagement. A total of 6 MFA members and 3 civil society representatives from Sri Lanka participated in the program. The MFA delegation for the ADD SOM were composed of the following representatives: Mr. William Gois (MFA Secretariat), Ms. Ellene Sana (Center for Migrant Advocacy), Ms. Josephine Valarmathi (National Domestic Workers Movement), Ms. Sumitha Shaanthinni Kishna (Migration Working Group), Ms. Marina Sultana (Refugee and Migratory Movements Research Unit), and Mr. Laxman Basnet (South Asian Regional Trade Union Council). With regard to the local civil society representatives, Mr. Andrew Samuel (CDS) and Mr. Sujeewa Dahanayake (LBB-Sri Lanka) joined the ADD SOM as well. This is a major breakthrough for MFA as the organization has been, for the longest time, has been advocating for the inclusion of civil society as in the official process of the Abu Dhabi Dialogue and other Regional Consultative Processes. 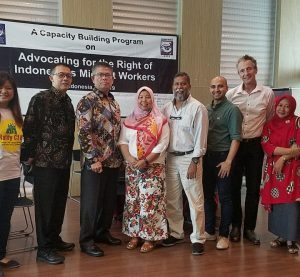 MFA believes that promoting and joining civic engagements is one of the key components in achieving better governance and ensuring that laws and policies for migrant workers have a human rights based perspective. Moreover, this year’s ADD SOM is the first time that the civil society is welcomed as members of the panel and not just as observers. The MFA delegation were able to partake in the discussions during the ADD SOM and were able to bring to the table the inputs that were gathered during the civil society parallel event. The MFA delegation were invited to be resource persons in 4 panels in the program. Ms. Ellene Sana spoke in thematic session one on the topic of: Comprehensive Information and Orientation Programming; Mr. William Gois spoke in thematic session two: Strengthening Joint COO and COD Government Oversight and Monitoring of Recruitment Practices; Mr. Laxman Basnet spoke in thematic session three: Certification and Mutual Recognition of Skills; and Ms. Josephine Amala Valarmathi spoke in thematic session four: The Future of Domestic Work in the Gulf. The significance of the CSO participation was indicated in the ADD Joint Communique where the MFA network was specifically mentioned.The joint communique as well included a recommendation for Civil Society to be enabled to contribute to the realisation of the desired outcomes of the recruitment platform of the ADD. This year’s ADD SOM is also significant as it is the first time for the African States of Kenya, Tanzania, and Uganda, to attend as observers. A number of GCC countries are now employing African migrant workers and their numbers are increasing.